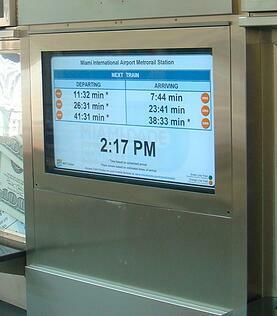 In 2011, The Miami-Dade Transit Authority was in search of a company that could design outdoor LCD enclosures for numerous train stations. Impressed with the fact that ITSENCLOSURES had the resources to custom engineer and fabricate enclosures specific to the needs of Miami-DADE Transit, ITS worked with MDT to develop various enclosure solutions. Specifications were created and released as an RFP to bidders. The Miami-Dade Transit Authority desired to upgrade stale, outdated static signage with animated, exciting digital signage. With over 25 stations in the Miami region, the project was a substantial opportunity, as each station required multiple LCDs paired with environmental enclosures and thermal management. One of the main challenges was the hot, humid temperatures of Southern Florida. Each unit would require thermal management to keep the electronics running at a consistent operating temperature throughout the day. Another issue discussed was potential vandalism of the units, since many would be within reach of passengers. In addition, MDT desired to incorporate a speaker system to alert passengers of delays and changes in the transit schedule. After competitive bidding on the project, ITSENCLOSURES worked with the successful contractor that was awarded the LCD enclosure portion of the digital signage upgrade. The project consisted of over 100 outdoor LCD enclosures. 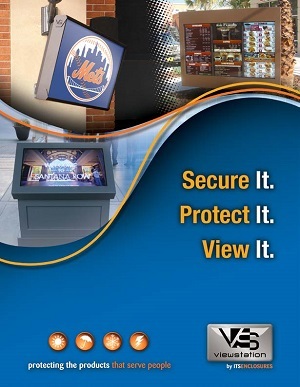 From the Summer of 2011 to the Fall of 2013, more than 25 stations across the Miami region were upgraded with digital signage enclosures, including over 90 ViewStation Array 2x1 LCD enclosures. With custom mounting, each enclosure houses two 40-inch LCDs side-by-side in landscape orientation and are fitted with an integrated speaker system for announcements. To solve the problem of vandalism, a four-layer sacrificial window film was added to the glass of each enclosure. In addition, 8 custom 55-inch ViewStation enclosures were designed specifically for Miami-Dade’s MIC (Miami Intermodal Center) station. The MIC station is located near the Miami International Airport. The custom enclosures were retrofitted into existing static signage, which saved Miami-DADE time and money. The Miami-DADE Transit Authority digital signage solution adds to the already successful transportation portfolio of ITSENCLOSURES. 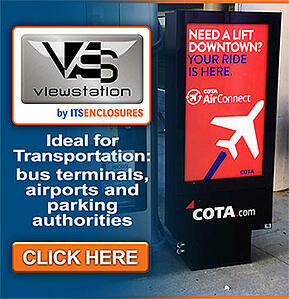 With the ability to custom design, engineer, and fabricate solutions tough enough to survive a rugged transportation environment, ViewStation digital signage is the perfect choice for airports, train stations, and bus stations across America and Canada. Let us know how we can best assist you! © 2015-2018 ITSENCLOSURES - All Rights Reserved.